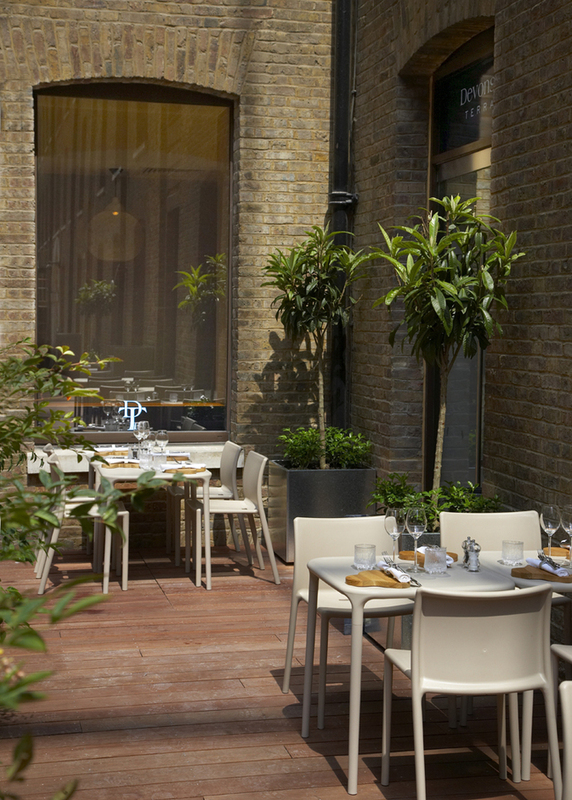 With an expansive covered terrace, Devonshire Terrace is the perfect al fresco spot. A stone's throw from Liverpool Street station, the courtyard terrace at this Drake & Morgan owned bar and restaurant is dressed with tonal textiles, tropical foliage and soft furnishings. Inside it's fresh and modern with soft moss, fir and olive greens set against natural materials like leather, marble and timber. Seasonal dishes, flatbreads and sharing boards are on the menu as well as small plates and gourmet sandwiches and burgers. There are vegetarian and vegan options as well as summer salads combining kohlrabi with watermelon, tofu, mangetout and candied walnuts and cherry tomatoes with orange, fennel, macadamia nuts and coriander. For business breakfasts there are fritters with poached egg, labneh and mint; avocado hummus on toasted gluten-free flatbread with dukkah and ricotta bruschetta with lemon, basil and honey. The Full Works comes as a vegetarian plate as well as the classic and you can top-up on your five a day with fresh juices and smoothies, blended to order. Devonshire Terrace gyms, sporting activities, health & beauty and fitness. The best pubs near London Devonshire Terrace. Devonshire Terrace clubs, bars, cabaret nights, casinos and interesting nightlife. Where to have your meeting, conference, exhibition, private dining or training course near Devonshire Terrace. From cheap budget hotels to luxury 5 star suites see our special offers for Devonshire Terrace hotels, including 196 Bishopsgate Serviced Apartments from 85% off.